“A friend” once dated a guy who, when it was time for bed, would brush his teeth, get under the covers, drape a ratty t-shirt over his eyes and be asleep—like genuinely breathing hard asleep—in about 30 seconds. He’d remain in that position, flat on his back like a corpse, for pretty much the entire night. If this sounds like an urban myth to you, keep reading. Does just seeing the words, “drifting off easily, staying asleep and waking up feeling somewhat refreshed” kind of turn you on a little bit? Same. 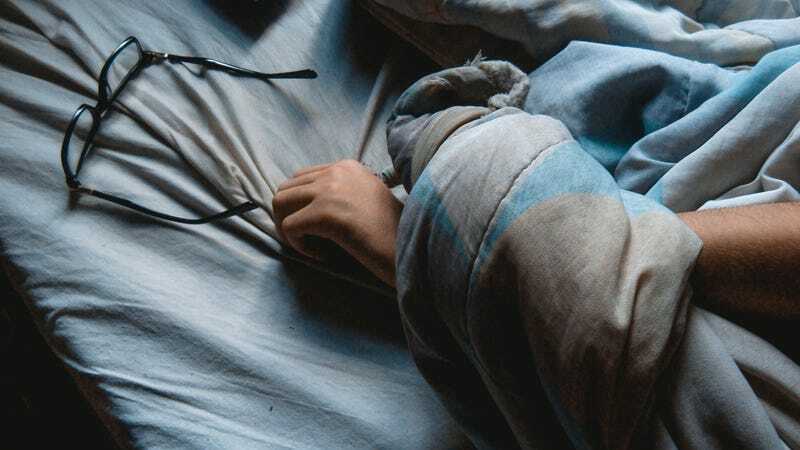 A solid sleep can be hard to come by—but developing a solid, easy-to-stick-to evening routine can get you closer to a full night of Zzzs than, say, trying said t-shirt-over-the-eyes trick. Most women we know love a good bedtime routine. As in, truly relish it and maybe even start looking forward to doing it as soon as they walk out the door to head to work in the morning-relish it. If you live with such a lady, you probably already know this. And if you don’t? Get a sleepover on the books ASAP because we’re here to tell you: You can ride the coattails of her herbal tea habit and skincare ritual all the way to a more blissful night’s snooze. Welcome to your sleep champion shopping list… Where sweet dreams are literally made of this. Investing in a good mask, some soft pillows, and a few other essentials will have you counting fewer sheep—and looking better in the a.m.—in no time. You know how your lady is all about getting cozy with her favorite “couch only” pants and a mug of tea when you settle in for “one more episode” of The Great British Baking Show before bed? You need to get in on that. If her tea game is strong (ha, brewing jokes) you’re in for a real treat. The most important thing about your night tea is that it doesn’t have caffeine. Duh, right? But that means stay away from greens, matchas and above all else, black tea. Where you go from there is up to you, though we like lemon and ginger blend because it helps settle the stomach after dinner. You don’t have to adopt the whole 5-step skincare routine your girl is doing each night—but we implore you to make a habit of at least two steps. First, wash your face before bed! It’s important to get rid of the pollution and oils that have built up over the day. Second, and literally last, follow that with a super-hydrating overnight mask or moisturizer that will soak in while you snooze, so you wake up looking and feeling refreshed. There’s something about having a set of clothes that are specifically designated for bed that really helps put you in the “this day is over, it’s time to sleep” mindset. Changing—rather than just stripping down to the boxer briefs you wore all day (*cough that’s gross cough*) and hopping between the sheets—is just more civilized. And kind of luxurious, if you think about it! We suggest designating a few tees and comfy boxers specifically for sleep, that way, as soon as you put them on, your brain is already thinking about bed. It’s like your very own Pavlovian experiment: See the jammies, get sleepy, repeat. Ahhh, this eye mask. Keep it in the freezer, and put it on right as you’re turning off the lights. The cold is soothing and has the added bonus of helping to “de-puff” your undereyes, which means less dark circles and looking more awake when you get up in the am. Feel free to leave it on while you sleep (the weight of the little beads inside is soothing) or fling it across the room as soon as it hits room temperature, you make the rules here. The tip here is actually two-fold: The first tip is, buy more than one of the same pillow. All you bachelor dudes out there with one memory foam pillow you got for Christmas, and a singular down pillow you stole from your parents’ house need to get with the program. You—and your guests, lucky you—will sleep better on a set of new, supportive-but-cozy pillows. Our vote goes to Casper for their pillow’s fancy dual-layer design, consistent “nicely fluffed level” (a term we just made up) and affordable price point. This diffuser has more than 28,000 reviews and a four-and-a-half star ratings on Amazon! That’s insane! Certain scents, like lavender can help with sleep by relaxing the body and nervous system, so load one up in your fancy-yet-cheap diffuser and prepare for the ultimate night of soothing, sensory-enhanced Zzzs.